Redcon1 brings us a brand new all-natural nootropic in Mental Trigger, claiming that it’s not limited to athletes, but to anyone looking for a mental boost for themselves, whether it’s a big college test or just a long day ahead of them. Now that got our attention so let’s check is out. The label is pretty straight forward, giving us the dose of every single ingredient in this product. But, some of the ingredients may seem new to you, so we are here to clear things out. Keep in mind that the doses in the label are for a full serving, which in this case is 2 capsules. Caffeine Anhydrous (250mg) – A focus product without caffeine?? Not in 2017! Mostly used as a stimulant, Caffeine Anhydrous is great not only for energy boosting, but for cognitive function and mental focus enhancing too. 250mg might sound a bit too much for some people, so you can start with half a dose and go from there. Hesperidin 92% (100mg) – Hesperidin is a unique type of sugar found in citrus fruits that helps preserve brain function. It also helps with memory loss and cognitive decline. TeaCrine® (50mg) – TeaCrine® is the trademarked form of TheaCrine, which is known to help with reducing mental fatigue and increasing mental energy and dopamine levels, which leads to better mood and all around better mental function. Mucuna Pruriens (35mg) – Mucuna Pruriens is usually used for its L-Dopa content. L-Dopa is a precursor for Dopamine, and Redcon1’s extract has 60% L-Dopa and that makes it a great source for Dopamine. Alpha GPC 90% (30mg) – Every mental enhancing product that respects itself has some form of Choline in it. Mental Trigger has the best form of it, in the Alpha GPC. Focus enhancing and better mental focus are just few of the many advantages of this awesome ingredient. BioPerine® (5mg) – BioPerine® is widely used in the nutrition industry as an absorption enhancing extract. It generally helps you get the most out of every single ingredient you get via Mental Trigger. 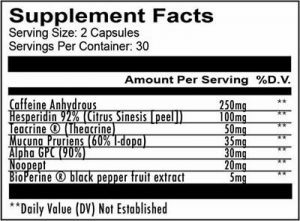 The Label’s Bottom Line- Redcon1 really did a great job with this product, a list if ingredients that looks like the who’s who of natural nootropics. It has everything you would look for in a cognitive booster and with the use of premiere ingredients and in their patented form it just an all around quality label. Effectiveness – First of all, we would suggest starting with half a dose, just to get a feeling of what would be the best dose for you to use. Our experience led us to get to the full dose after a couple of weeks, and boy do you feel the difference. We certainly felt the enhanced focus for both short and long term and in our experience it came bundled with a boost in our mood. As for memory function, it is really hard to tell so we will put it in the ‘the jury is out’ category. 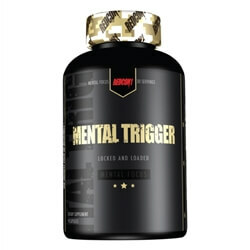 Right now, Mental Trigger is sold for $49.99 for a 60 capsule bottle. This puts it on the high-end of the scale, even more considering it’s 2 caps per serving. We have seen it for as low as $35 on some specific sales. In any case, you should of course use Fitness Deal News to compare prices for any supplements using our price comparison engine and sign up to the deal alerts newsletter, so when a deal pops up you’ll be the first to know about it! Redcon1 did an excellent job in delivering a good, effective, quality product in Mental Trigger. It deserves your focus & attention (got it? :)).